Hook some fun with a paper fish craft. These fun paper craft ideas bring the ocean to life with a variety of different materials, most of which you may already have on hand. All of the following projects are suitable for kids to make with adult supervision. Use a variety of paper colors to create an eye-catching assortment of crafts. Construct a fish out of various shapes to help kids use their imaginations. Cut shapes such as hearts, triangles, diamonds and circles out of various colors of construction paper. Allow the kids to construct a fish out of the shapes by gluing them onto a blank sheet of paper. For example, you can use triangles as fins and hearts for body shapes. This craft is a fun way to capture your child's hand prints. Roll tempera paint onto your child's hand, covering it completely. Have your child press his hand firmly onto the paper sideways so the fingers create the tail of the fish. Apply additional paint to your child's fingertips and allow him to make details such as gills and fins by pressing his fingers into the corresponding areas. After the paint dries, finish the craft by adding eyes and scales with markers. Hang this fun fish bowl on the wall for an instant aquarium. Cut out the shape of a fish bowl from a piece of poster board or construction paper. Cut out and remove the center of the fish bowl leaving only a 1-inch wide frame. Glue a piece of blue cellophane to the back of the bowl so it stretches tightly on all sides. Trim off the excess cellophane from the outside edges of the paper frame. Spread a thin layer of glue onto the bottom of the cellophane and sprinkle on craft sand to simulate the bottom of the bowl. Apply some fish stickers to the cellophane to complete the project. 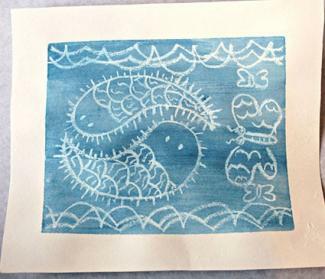 This art technique is a lot of fun for kids who get to watch their fish magically appear before their eyes. 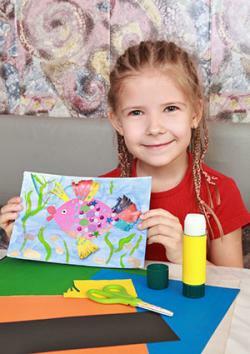 Have your child draw a picture of a fish on the white paper using a white crayon. Encourage them to add as much detail as possible, such as scales, fins or seaweed. Have your child apply blue watercolor paint to the entire piece of paper once the drawing is complete. The crayon will resist absorbing the paint so the fish will appear through the blue. This fun craft can use up a lot of little bits of craft material left over from other projects. Have your child cut a large fish from a piece of construction paper and glue it to the center of a second piece of paper. Allow your child to decorate and embellish the fish using other craft materials, such as using felt or wrapping paper as fins, sequins as eyes and puffs for bubbles. 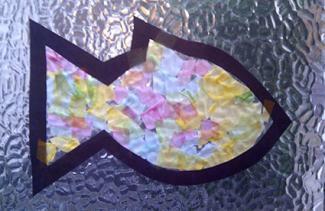 This tissue paper fish makes a great sun catcher when hung in the window. Cut a large fish shape from a piece of construction paper. Carefully cut away the interior of the shape, leaving a 1-inch frame showing the fish shape. Carefully apply a piece of contact paper to one side of the fish and trim away the excess. 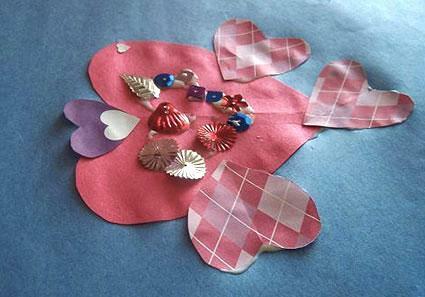 Have your child stick squares of tissue paper in a variety of colors to the inside of the contact paper. Apply a second piece of contact paper to the other side of the frame to seal it in. Trim away the excess. A paper craft project works well for any occasion. Whether you hang them on the wall, on a bulletin board or suspended from the ceiling, the kids will enjoy seeing their fish artwork on display. Make one or all of these crafts with your kids to capture some fishy fun.